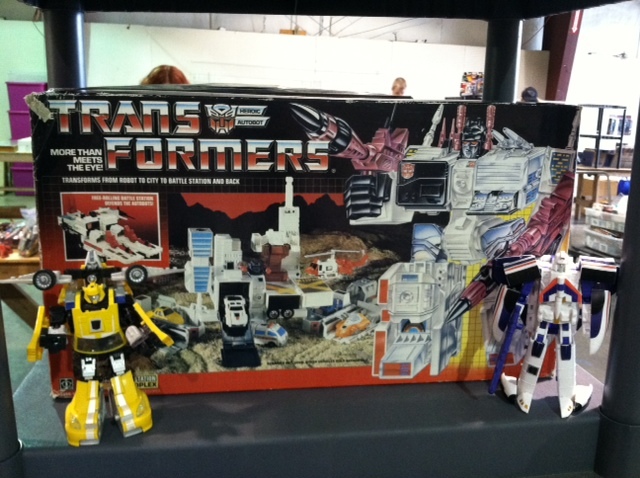 I have never been very knowledgeable of the "girl cartoons" or "girl toy lines" of the 80s. It just wasn't that important to me. 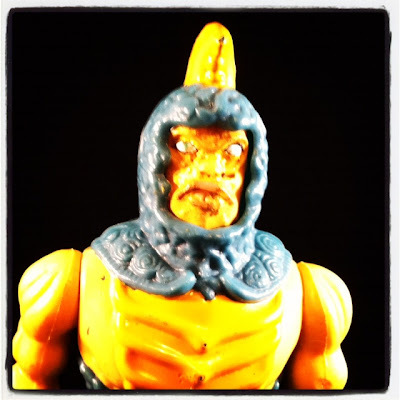 I liked She-ra but only because of the obvious connection with the obvious connection with He-Man and Masters. It never felt like a girls cartoon to me. It felt like another action cartoon with fantasy elements. 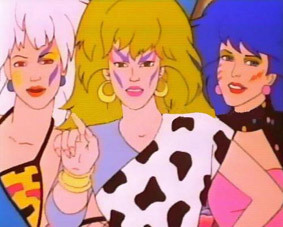 One cartoon I never got a chance to watch as a kid was "Jem" I just never saw it, but I know I would have been turned off by it. 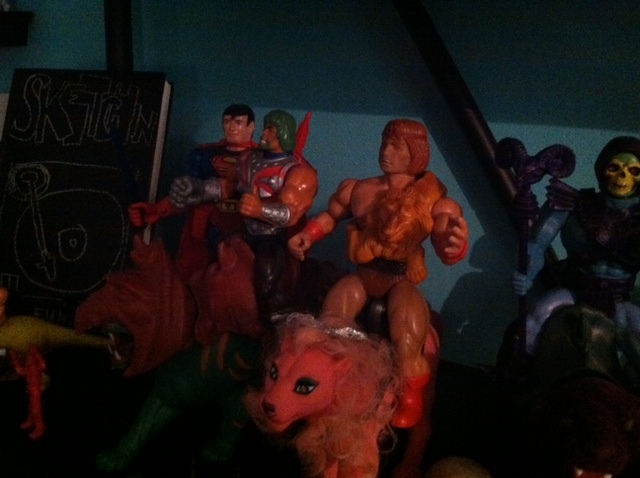 My friend Rachel is as big of a Jem fan as I am a He-man fan (well maybe. . . ) and she talks about it quite a bit. This weekend my Wife (who did watch it a bit) and I started watching it on netflix. What a stark difference to the shows I watched as a kid. It was formatted less like the cartoons of the time and was more akin to a soap opera. Right from the intro you get strands of drama, romance, and music! Really that is what it is all about! Oh. . . and magical ear rings. It's all pretty outrageous! With the few episodes I have watched so far, the show is filled with character interactions and strange moral dilemmas. the strangest being Rio who is Jerica's boy friend who has this strange interaction with jem, and he feels guilty. . . except he doesn't know that Jerica and Jem is actually the same person. It is some interesting interplay! 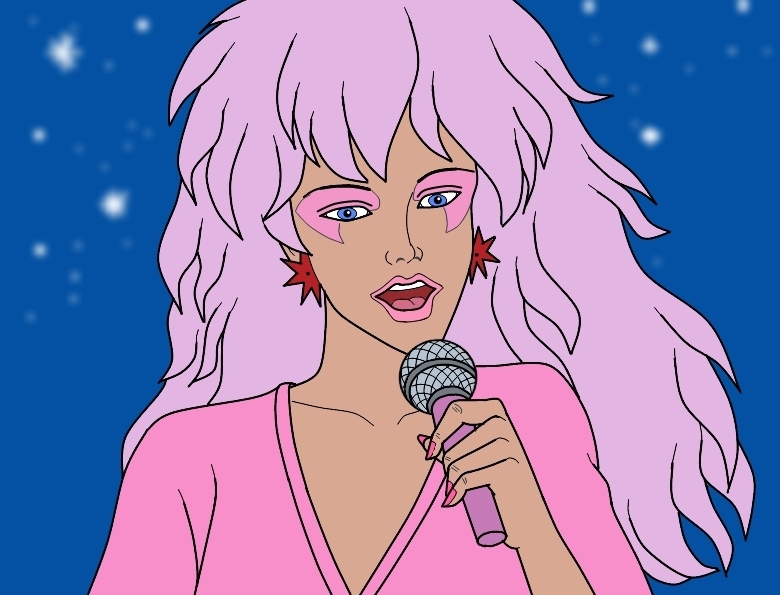 Jem is so different from the cartoons that I watched as a kid. 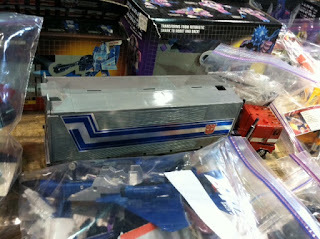 It doesn't feel like any of the filmation stuff, and it also doesn't feel like transformers or G I Joe. Other than the fact that there are strong female characters in both shows, it doesn't even really compare to She-ra. They portray the strong characteristics differently, with less emphasis on character drama in She-ra. In terms of story though, Jem was telling a much more complex and adult story than anything else I have seen from the era. The story continued from week to week making it feel like it was part of something bigger. I could imagine young girls feeling like they were into the world pretty thoroughly because of this structure. I can't really talk about Jem without talking about the music. 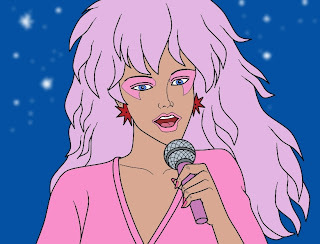 Jem is the Magical front woman of the band "Jem and the Holograms." Every few minutes a song breaks out in music video style. The songs aren't bad. They are very much of the time. Not nearly as "Rocking" as their outfits would have you believe though. There is another band as well. 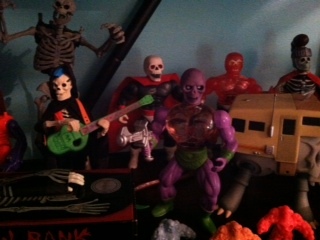 The Misfits, they are the bad guys in this story. They thrive on jealousy of the holograms. All of their motives are based on that. They are pretty cardboard for the most part. They do, however, have the coolest hair! They just look evil too! If you are interested in cartoons of the 80s, then you should check this show out for sure. It is currently on netflix, so I recommend you watch it! 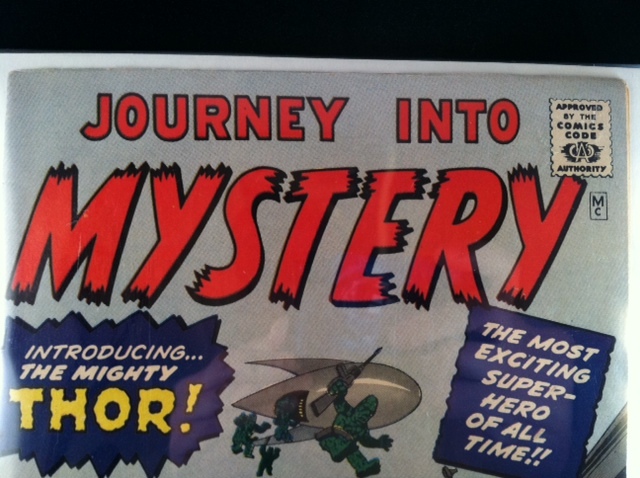 Thor and how I came to grips with a comic book! A lot of stream of consciousness in this one. A few weeks ago I reflected on going to see Thor in the the theater with my dad. Since that post I have thought a lot about the way I have perceived things over the years, and how those perceptions have changed since I have grown up. In the that post I said that while I was growing up I didn't care for Thor. Thor, Captain America, heck all of the avengers seemed like a much more mature line. Not in terms of content, but they all seemed like comics that adults understood(especially Captain America.) As a little kid looking in on it I wanted fantastical adventures, with fantastical villains, not war heroes. Of course, I realize now the folly of my thoughts with Thor, but for some reason the concept board me. Like most kids I liked Wolverine and the X-men. I suspect I liked them for the variety of powers. It's actually strange how my ideals have changed. 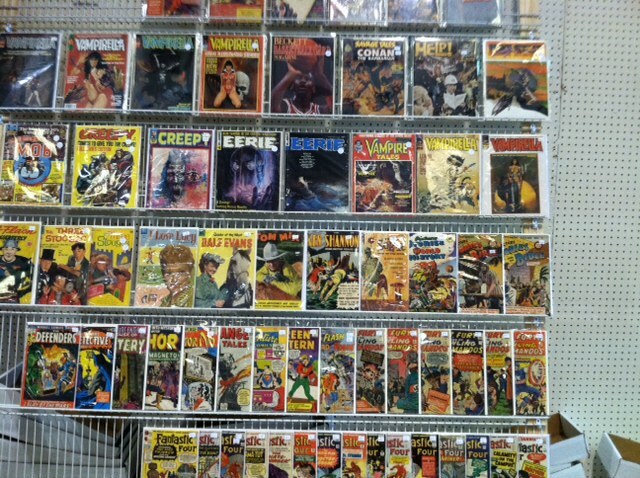 As a kid, I liked the novelty of comic books. It was cool to collect them. I was never really interested in reading them, other than to just look through them, and then I would put them in their bag, board them and stick them in a box (they are all still there.) I have since gotten back into comics as a reader (mainly because of trades). I have come full circle in some ways. It was Actually an 80s toy line that brought me back to Thor. 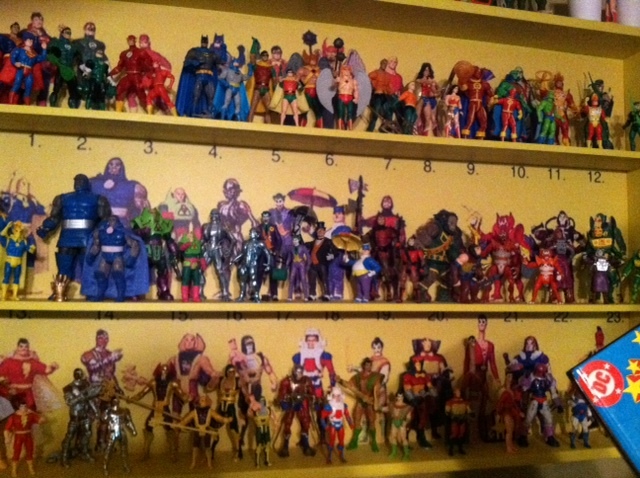 I have expressed my love for the Super Powers collection on several occasions on this blog. The toy line is great and was fun as a kid. 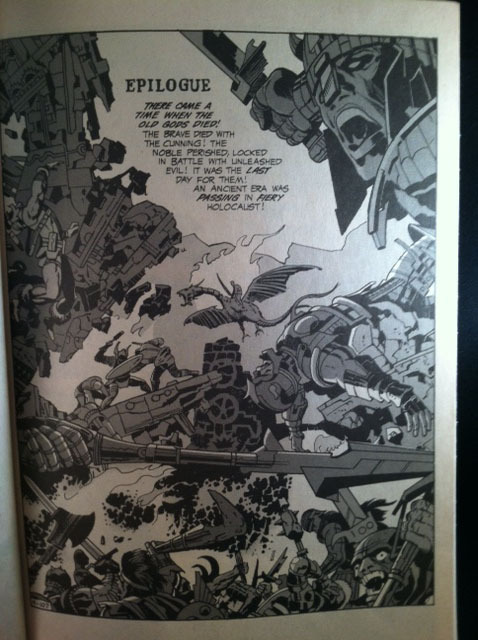 As I was doing research into the toy line I found that Jack Kirby did several of the designs for the line. He redesigned Brainiac, Lex Luther, and even some of his own character such as Orion and Kalibak. He also did a comic book for the same line. 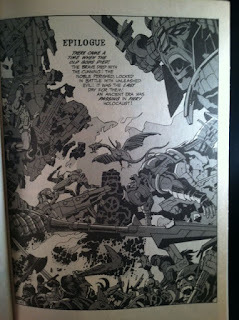 This got me interested in Jack Kirby as an artist and his career. 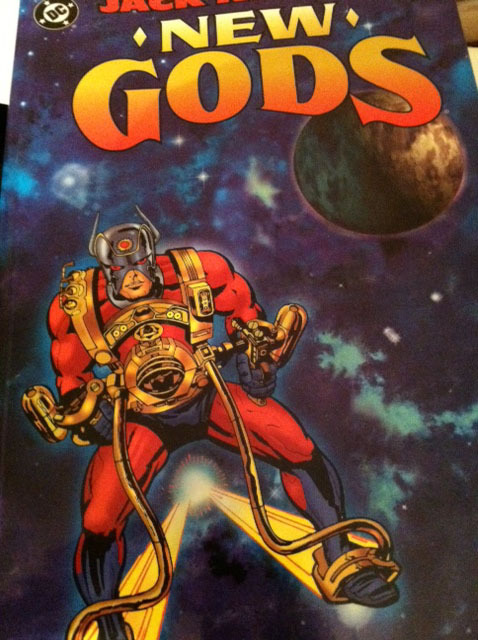 I tracked down a copy of the new gods and loved it! I was most intrigued by the first page of the first issue, where Jack, sort of said goodbye to Marvel, and the world he had created with Thor. 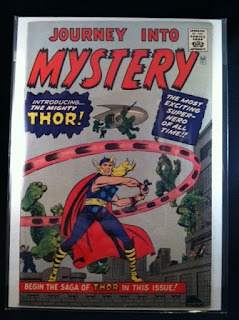 Because of my Dad I was always familiar with the elements of Thor so it was interesting to see. I read through most of the forth world stuff and was still intrigued, so I found my way back to Thor. And now I find him the most interesting of the Marvel Heroes. It's an odd Journey I have taken to see my tastes evolve. 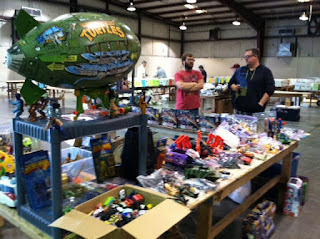 I realized it the most this last weekend when I was at a toy show. I saw something that intrigued me. 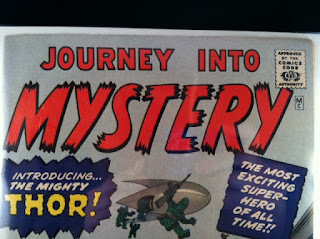 What looked to be a copy of Journey into Mystery 83 in decent shape for MUCH less than that book should go for. I asked about it and found out it was a silver age reprint that was done in 1966 called the Golden Record Reprint. It came with a record originally. 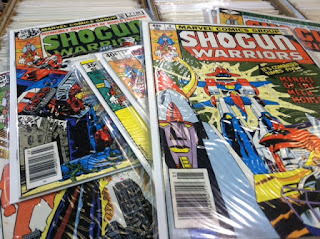 They made many of these reprints for several of the Marvel number 1s. They even have a bit of value themselves. I was intrigued and I wanted to get this for my dad. 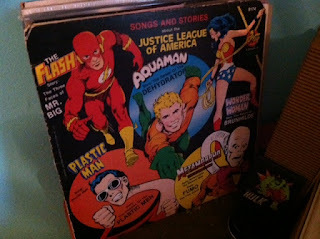 This comic was one thing my Dad has always wanted, and this is the closest he will ever get to having it. I decided to spring and get it. It is such a great cover, and this is one of the greatest pieces of Kirby art there is. The only difference in this comic and the actual one is that it does not have the "12 cents" in the upper left hand of the book. This was quite a find for, and I am glad it could help me complete my journey in finally discovering a love for Kirby and Thor. It's that time again! The league has called and I must answer. This time we are going back to our youth and think about that least year of childhood the 12th year! Super man had been dead for a few month now, and was yet to be revived. Funerals were being held! There had been runs on comic shops across the world to buy massively over produced comics. 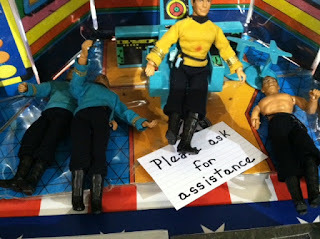 Even the "Normals" had graced the doors of the all forbidding comic shops in the hopes of a large pay out down the road. Nerd culture was beginning to change even then, and I wasn't even involved yet. 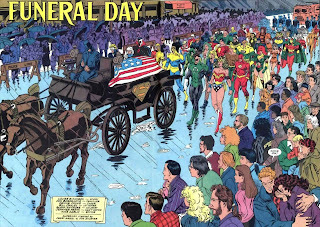 In 1993 though superman was buried and did eventually come back. I had been into comics pretty heavy for the last few years thanks to my dad and my uncle helping me out. 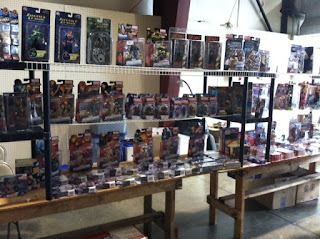 I was still collecting in 93, I was a wolverine fan and Wolverine 75 fame out that year. I remember there was a lot of hub hub about it. to be honest I didn't really read a lot of the comics. It wasn't until a few years later that I would understand that reading wasn't a bad thing (not sure why really.) Wolverine was what I lived for though. That, of course fed into my love for toys. 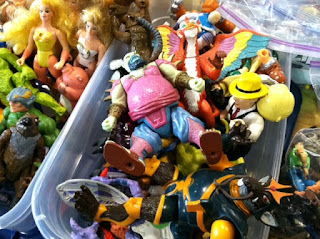 X-men and other marvel toys had been being put out for the last few years, but in 93 they really pushed it up. This was in large part due to the success of the X-men Cartoon that was currently on fox (which I never really got to see as we didn't get a fox affiliate.) There were lots of action features and lots of new characters being put out that that were in the current comics. Looking back the toys weren't that great, but they were a lot of fun and they were the best thing we had. They were finally putting out new super hero toys, which is something kid's hadn't had for a while. Take a look at this commercial for the line. I remember going to school telling my friends what I had discovered. Transformers were back! I was so excited. 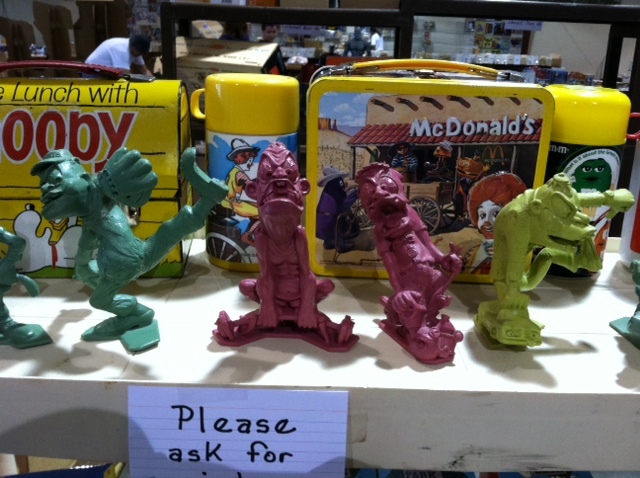 I didn't even think about them being made of horrible plastic or their bright neon deco. Some of my nerdy friends were excited too! We were all excited to see it back. 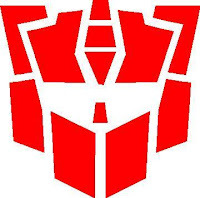 I remember a transformer craze hit us all. 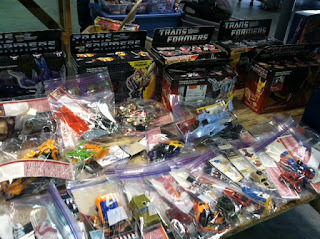 We all began going back looking for our old transformers and traded them! It was a glorious time actually! 1993 was also the year of a few movies worth mentioning, Jurassic Park brought life like dinosaurs to movie screens every where. Kids love dinosaurs and I was no different. My dad took me to see it, and I loved it. It was even a little scary. Even though I don't care much for the movie these days, it is still very memorable to me. 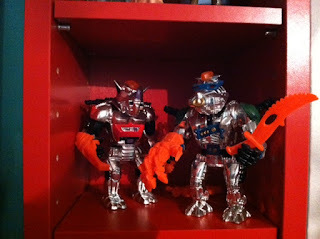 93 also brought the 3rd installment of the tmnt movie franchise. I remember even as a 12 year old being a little jaded about this movie. It didn't capture the essence of the other two for me (not to mention I was getting tired of the turtles as a franchise at this point . . . somewhere deep inside something was telling me to grow up. . . eventually I ignored that.) I actually haven't seen that move since I saw it in the theater that year. I should probably at least try to watch it! As I write this I think about not only the 12 year old me, but also about me now. I realize I haven't changed much from that 12 year old self. I am a caricature of myself at that age. My 12 year old me would have liked me I think. 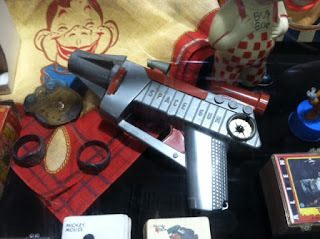 I love the things I loved then, except now I have some kind of disposable income, that I did not have then! Collector Friends are Great to Find! 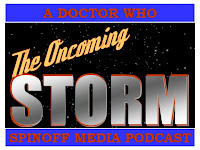 Yesterday I talked about the show that I did this weekend. It was a good show, but I would have never been able to do it without my friends Brad and Stacey. Brad helped us get the spot on short notice, and he offered up his house for us to stay in the night before. Their Hospitality was so great. The interesting thing is that I met brad by mistake about a year ago because I bought something at a show that he was going to buy. From there we formed a great friendship. that is what I love about the collector community that I have found myself in. Most people are so kind and excited to help out. 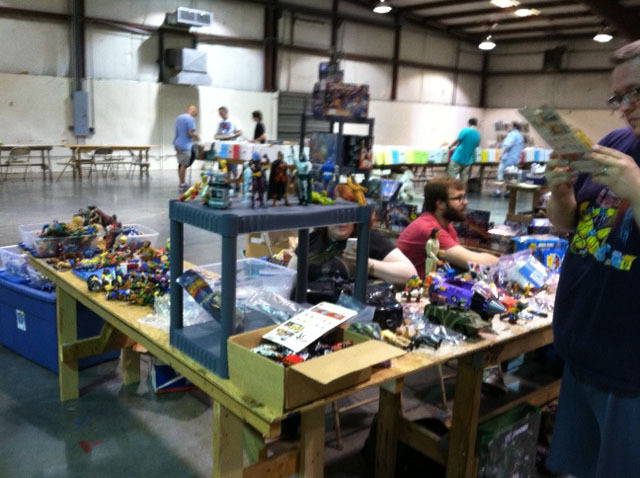 While my brother and I (have I ever actually mentioned that I vend with my brother) were there, we had the honor of seeing the massive museum like collection that these two have acquired. It was funny because we were trying to find the house and as we passed it my brother said "That must be it. Its filled with toys!" And it is, if you have never seen anything like this try to!. I took a few pictures here and there of their stuff and they have allowed me to share them with you, gentle reader, so enjoy! 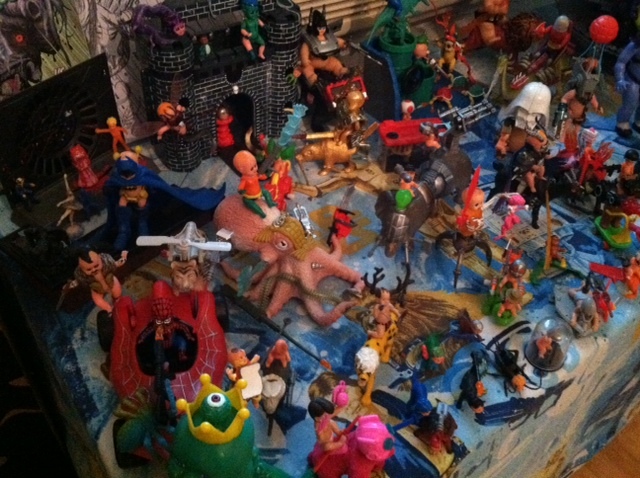 Their collection is the way I like a great toy collection it is very eclectic. These pics do not represent anything near all of it. I simply took a few pictures of things that stood out to me. This place is a history museum and an art exhibit all at the same time! 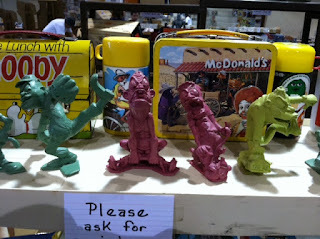 There is a story to go with EVERY piece in their house. Such a good time was had! 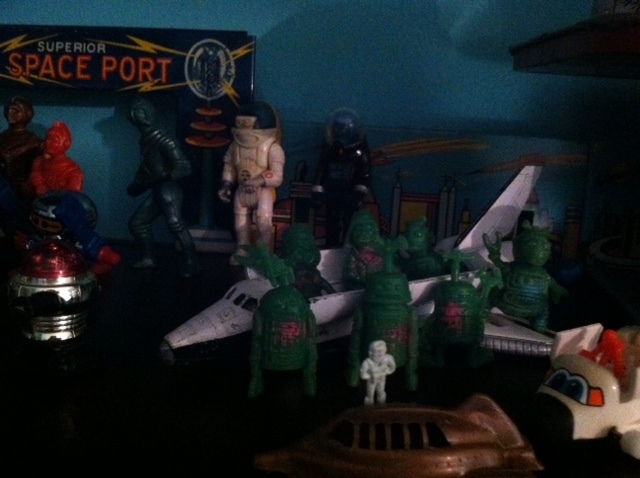 This is kind of the center piece of Brad's Collection. I had seen pictures of it, but until you see this custom REAL LIFE Super Powers card back, you just can't conceive the grandeur of it all! Yes those are all Skeletons, and that Jewel thief used to be mine! You never know exactly what you will find. Turn around and there is something new. 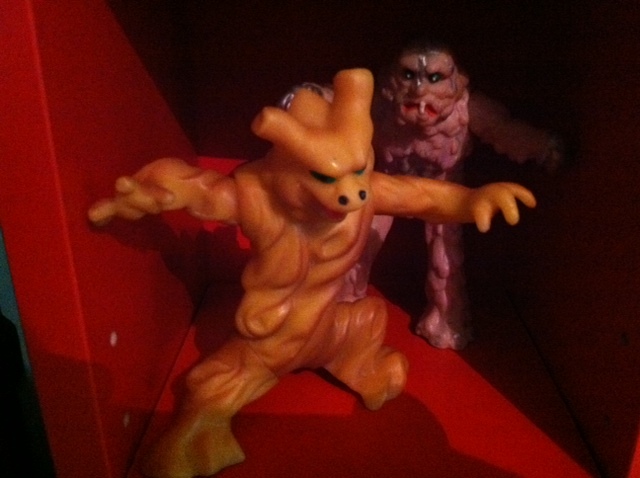 The collections that they have are all great but then you turn around and you see BATTLE BABIES. This is an independent art toy line that Brad Makes to sell. They are fantastic. 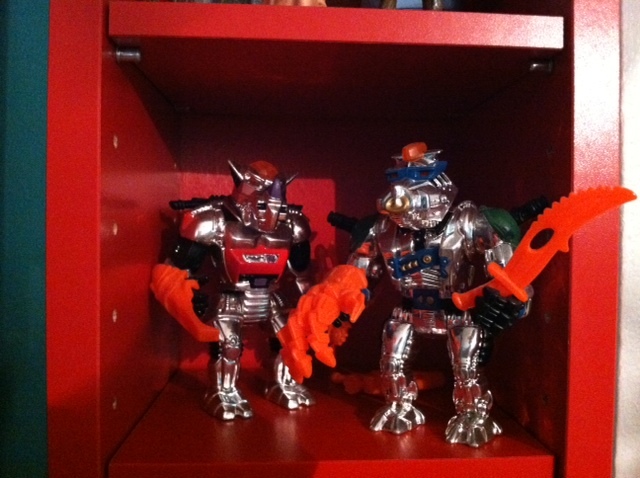 They are babies with parts from vintage toy lines. Keep an eye out. 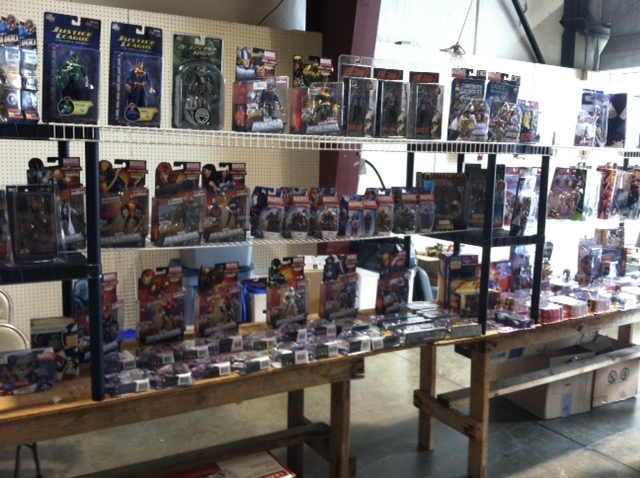 They have closed the store down for a bit in preparation of being at Heroes Convention. But check them out it will be worth your time! I will be posting more about them in the weeks to come. This is the cart that brad keeps all of his parts and materials. 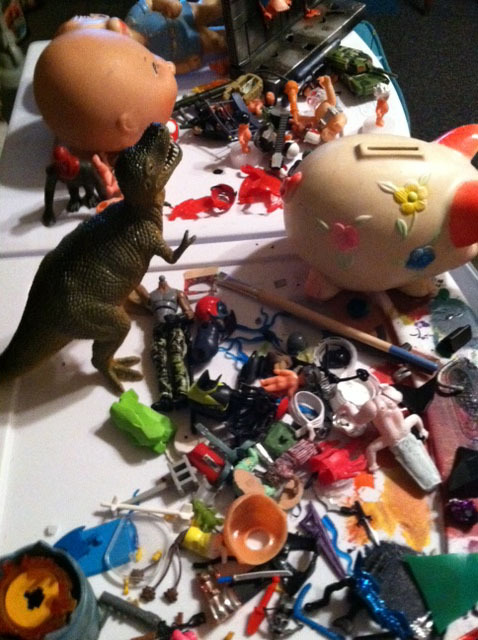 You never know what you will find in these drawers. Put this in your Easter Basket Krulos! This weekend we dis the second show of the season. I only found out about it a few days before and was in a rush to get set up for it. My friends Brad and Stacey (the Geeky Vixen) helped us so much to get going with this show So a big shout out to them. I'll have more about the visit with them later this week. The show was actually for a charity. 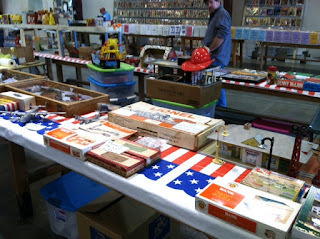 All of the proceeds of table sales etc goes toward the children's miracle network. I was happy to be involved. The show was fun. the room was big and there was a bustle of activity going on as we walked in and people were hurriedly setting up tables of comics and toys and anything you can imagine. One of the coolest parts about it was that I could drive my car right into the building to unload. 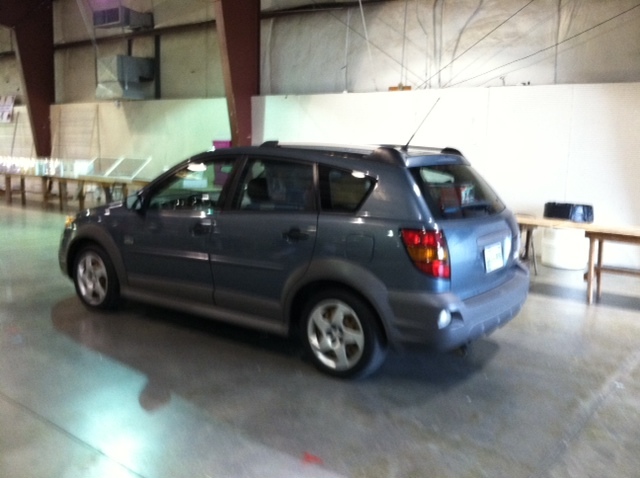 There was a lot to unload, Actually I probably shouldn't have legally been driving with the car packed that full. 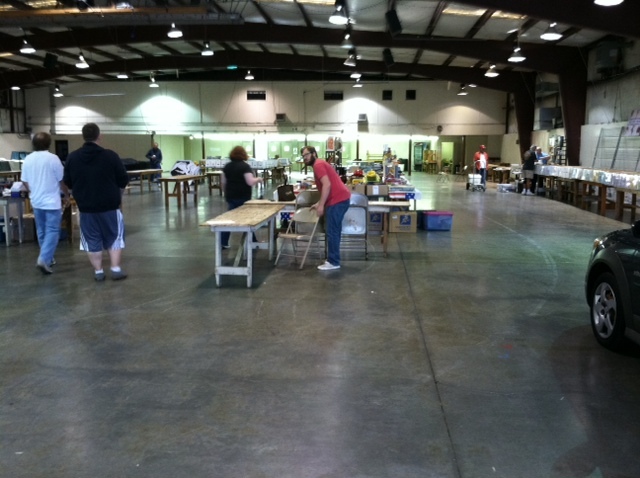 With Brad and Stacy's help we quickly got the car unpacked and started setting up the table. 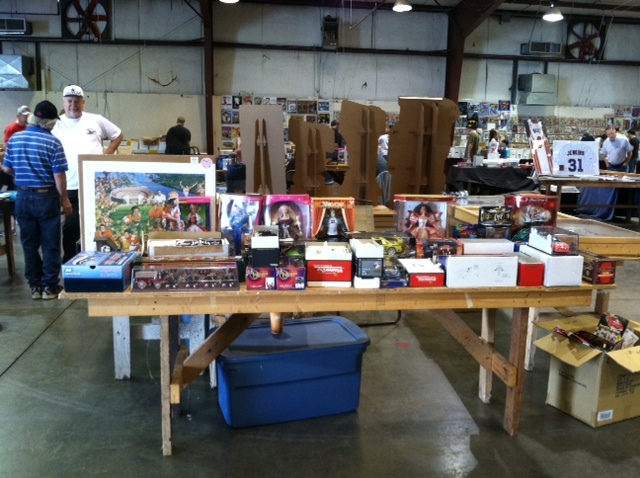 we actualy had so much stuff we had to get another table. So that we would have enough room. What did sell though was our loose stuff. People love the loose stuff. 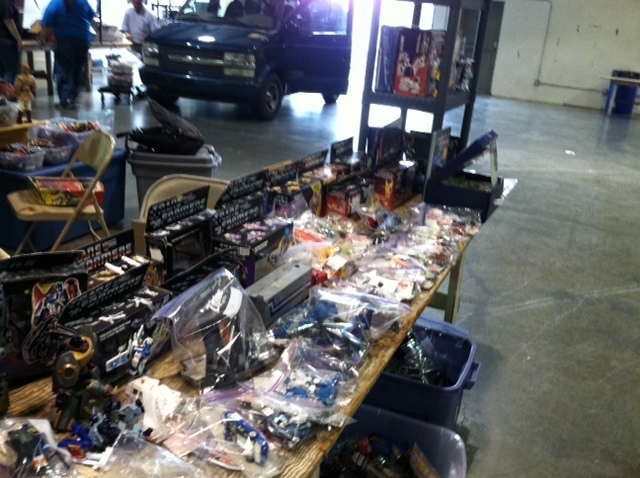 That is what we sell the most of as well, and we have to get quite a bit more stock now after this show. This is an after shot that was taken near the end of the show. We had a lot less. What amazed me was the number of people who wanted to buy whole lots. 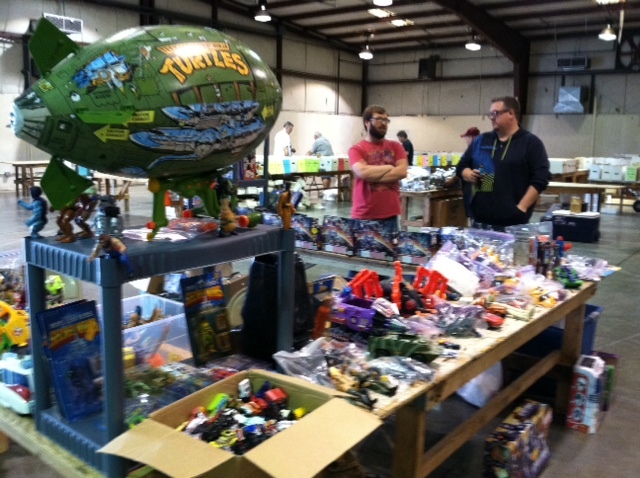 We sold whole collections of G I Joes, Ghost busters, and a large number of MOTU and TMNT stuff. 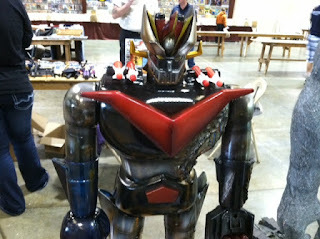 There was of course lots of really cool things around the show that other vendors had. 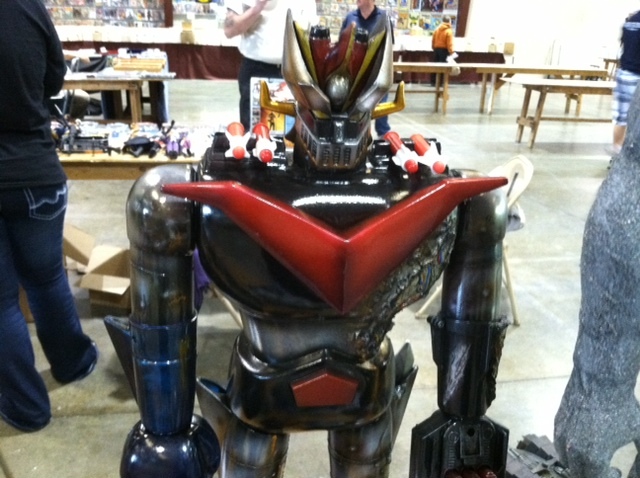 This is an awesome custom that an artist at the show had done. My friend Shannon always has some awesome new stuff! 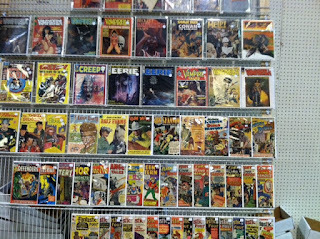 Comics Old and new could be had. I actually bought my first high priced comic. More on that later. Over all the foot traffic of this show was OK, it wasn't what every one wanted, but the people that did come was buying. 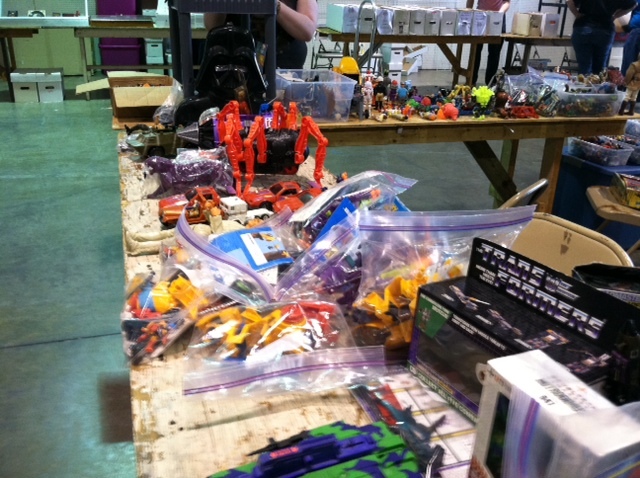 and they were buying some awesome stuff, and were getting some great deals! You never know what you will find at these shows. And it was a great show to see what you would find. If you have local shows in your area please support them they are always awesome to go to! I'll have updates on some things we picked up later this week. The League: Running into a fire! 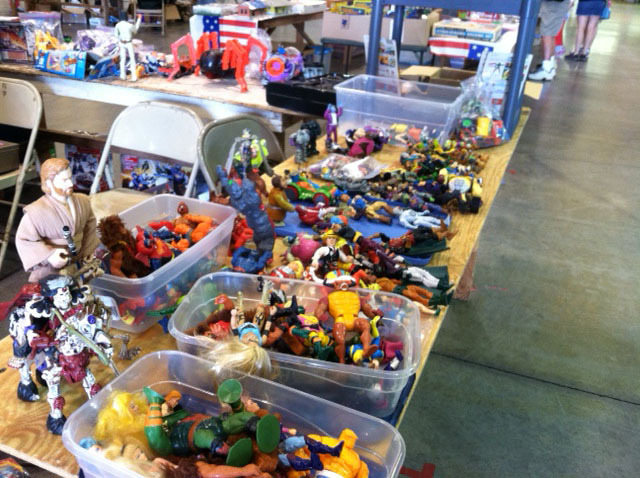 What is the one item in your collection you would save if your house was being swallowed by a sink hole, carried off in a tornado, and then swept away in a flood. I know the answer to this one. I have answered it recently! The piece that I would "run into a fire for" would be MY he-man. this isn't any he-man it is the one I had as a kid. 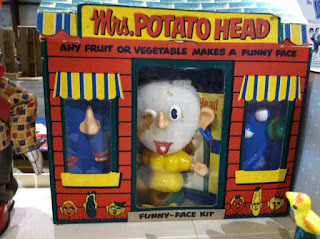 The toy that probably started it all! 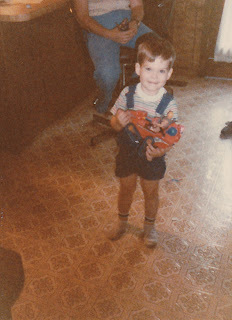 I am lucky enough to still have that toy. He sits aloft MY battle cat on my desk, next to my Battle Armor Skeletor and Panthor. 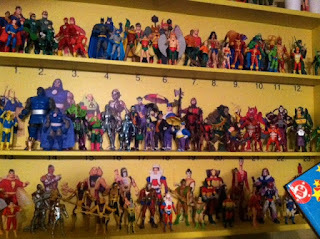 All of these are very important but if I had to pick it would be He-man. My he-man is dirty, with loose legs. I have several that are in better condition, but I do not have a history with those, and that is important to me. 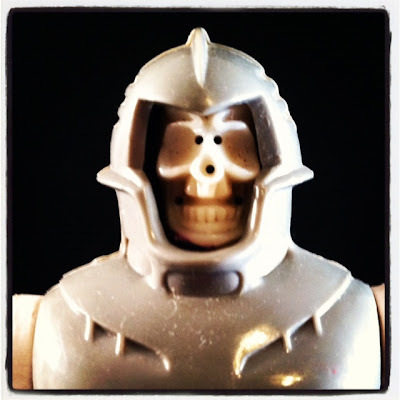 Below is a pic of me on the day I got the above pictured He-man. I was a happy little guy! 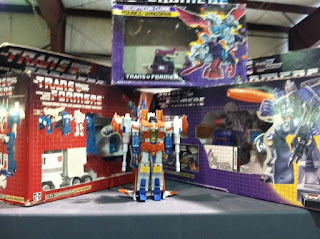 I mentioned this figure in the prototype episode of collecting nostalgia when this very question was asked! check it out! Check out these other League posts. Jason Vorhees says his prized possession is a set of five robotic Lions! Over at Team Helios Kevin Talks about a Hulk comic that has been on my want list of YEARS! On Saturday I went to watch the Three Stooges. I have been excited about this movie for a while. The Three Stooges used to be a staple of my young life as they would show up in weekday syndication just after the go-bots and other day time cartoons I would watch. Needless to say I am well versed since an early age in the Stooges. I went to the movie with the knowledge that I shouldn't expect too much, but from the trailer I was pretty happy with the actors and and was certain that I would at least come away with some very good laughs! I was not wrong. 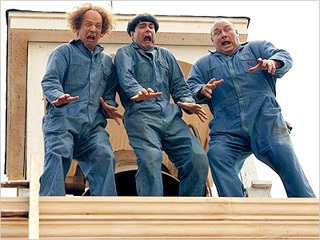 For me the Movie delivered the kinds of laughs you would expect from a movie about people who hit each other with hammers. The actors were dead on! Not perfect but very good.Chris Diamantopoulos as Moe took on the role well. He really embodied the leader of the trio! He is the one that critics are saying "owned" the role the best, but I have to say that I think Sean Hayes as Larry took that honor. Larry was always my least favorite, but in this movie he shines as a character! Sean takes on all of the tropes and runs with it. Curly was played by Will Sasso in the movie, I have to say that he is the character that I feel is much more an imitation of the character, but I don't believe that is the fault of Sasso. It seems like the version on the screen was written in a way that encompassed the childhood memories of the the writers. There were about four tropes that were repeated over and over! I felt like the character could have had a bit more depth, at least they could have picked up on a few of Curly's other mannerisms. My biggest complaint is something that I did not see in the credits. Not all that said I could have missed it BUT I watched pretty closely. 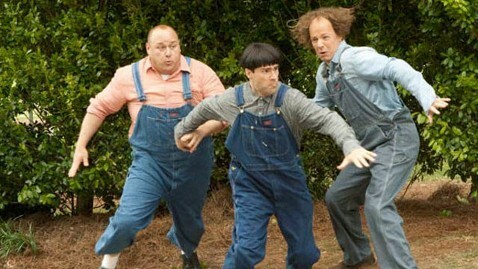 There was no mention of the Howard brothers or the original stooges. No dedication, no "Based on characters portrayed by." That is upsetting considering this has been billed as a labor of love for so long! Just a small complaint but I feel like they could have gotten a mention. Something that intrigues me about this movie are the reactions of the critics. I can't imagine anyone expects anything other than what it is. It suffered the same fate of Mr. Bean Movies, you take a very physical comedy and try to give it a context by building it around a story. The story IS going to be secondary. The plot is going to be thin! 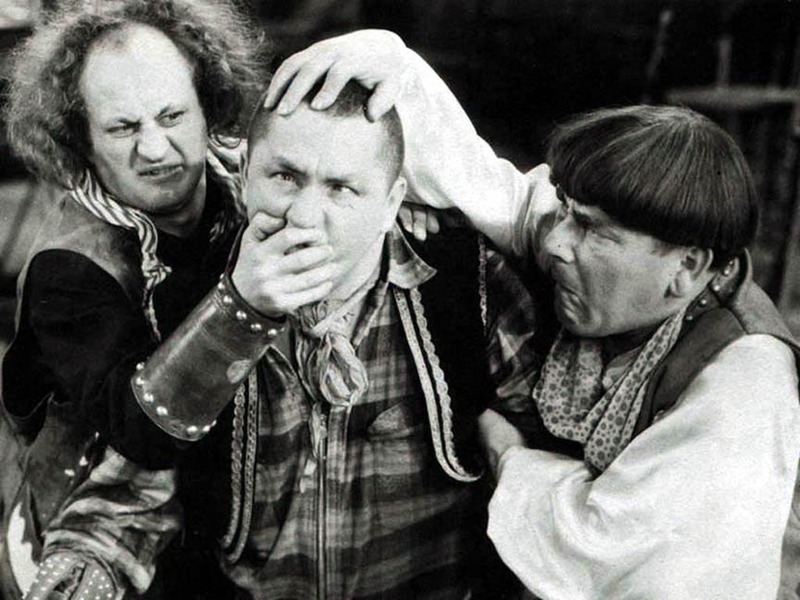 There is also a thought that the three stooges as a concept is very much a part of their time, and are not relevant to today's audiences. This may be true. we live in a time where crude humor is the funniest and they are from a time when what they were doing was kind of considered crude humor. So in a way it is a product of its time. I'm not sure today's audiences want slapstick comedy! I think it may work better in a TV environment. The popculture refferences (from modern pop culture) and cameos just kept coming in this movie. But the biggest one was the cast of Jersey Shore. At first it seemed like an odd inclusion, but it was something where the execution actually worked! I was shocked, but it was funny seeing tongues being flat ironed and microwaves being pushed over peoples heads! I think Moe was doing what a large portion of America wants to do! The movie was a fun romp, where you can turn off you r brain for an hour and a half! If your going for fun go for it, if you ware going for an engaging plot then you should skip it. Show Scores! Knoxville Collectors Showcase!